With the NHL on its Olympic hiatus and the local NBA teams on extended road trips, there's not much going on in New York these days. To fill the void, I've decided to add college hoops to the sports menu this week. I'll end up seeing 5 games in 8 days as I try to catch my own version of March Madness a month early. I have mentioned my friend Eddie, who lets me know about all the schools and games in the region. I never realized just how many universities there are in the greater New York area and there seems to be a game nearly every night. 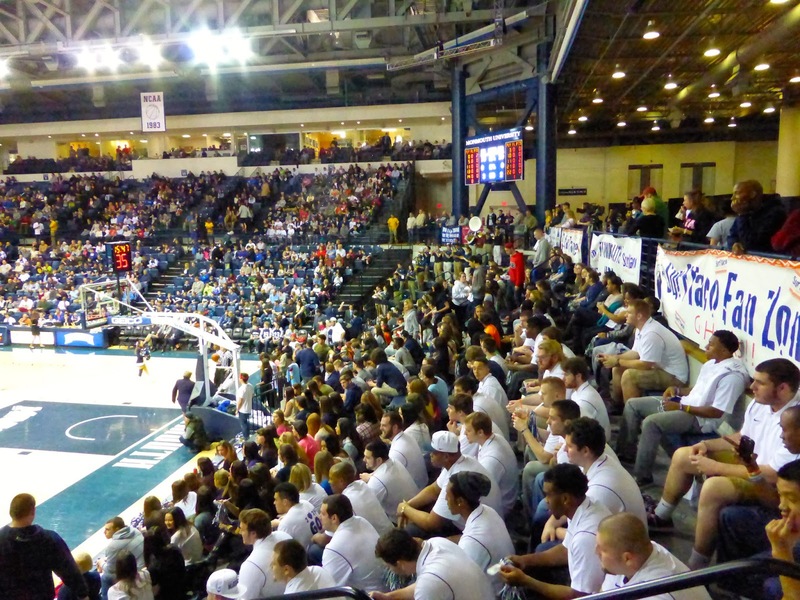 On Saturday, we had two options: Princeton hosting Harvard in the Ivy League, and Saint Peter's at Monmouth in the Metro Atlantic Athletic Conference (MAAC). 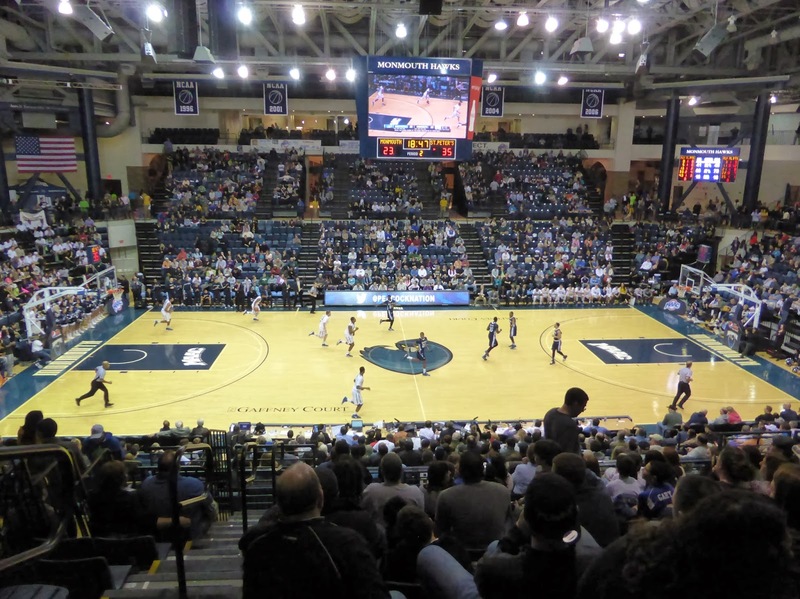 Both are about 90 minutes from where I live, but Monmouth had two advantages: we could get tickets (the Princeton game might have been sold out as tickets were not available online), and our friends at Stadium Journey needed a review. So down to West Long Branch, NJ we went. Eddie had rented a car for another trip and had kept it an extra day, allowing us to avoid a long public transit ride. 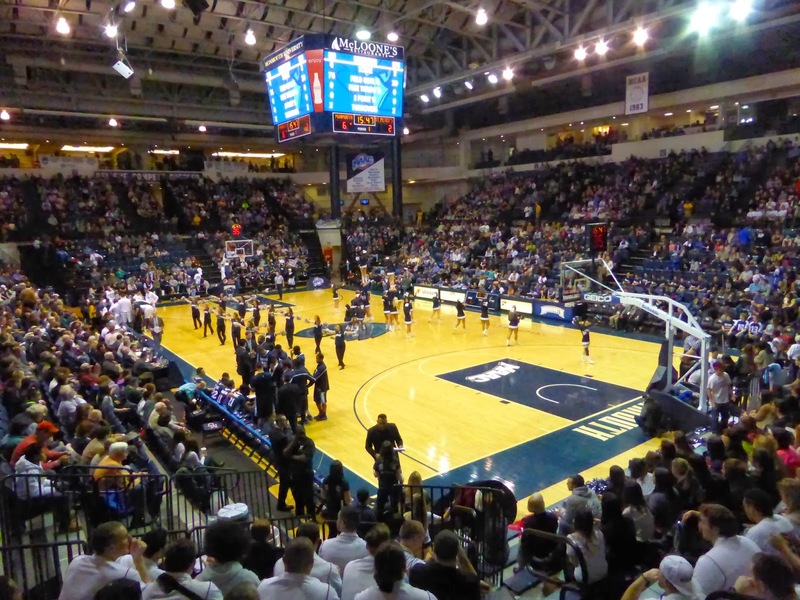 After picking me up, we raced over to New Jersey and down the Garden State Parkway arriving at the Multipurpose Activity Center just after the 7:00 tip-off. 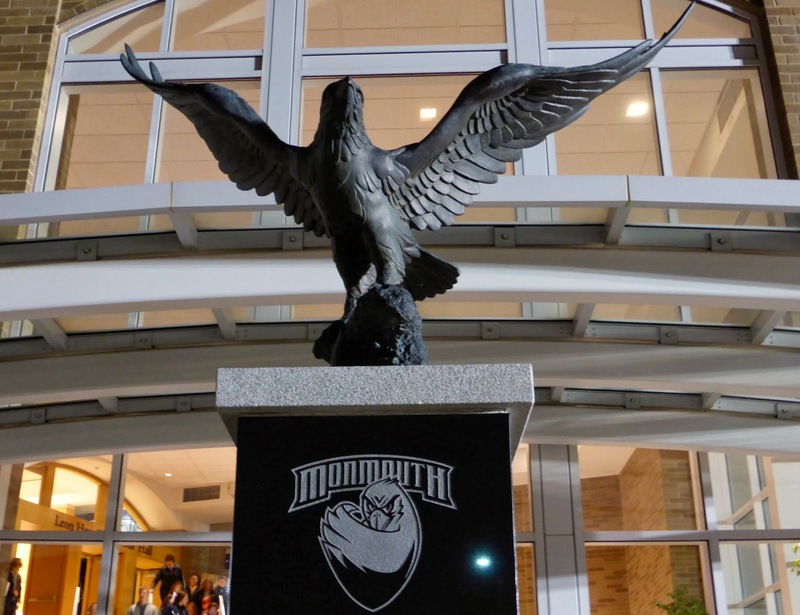 The entrance is signified by a sculpture of a large hawk, and just next to it is the box office. Tickets were $12 at the window, which had several fans debating their options while we waited anxiously. Aargh, the game is starting, get out of my way! We finally acquired our ducats and headed into the arena. 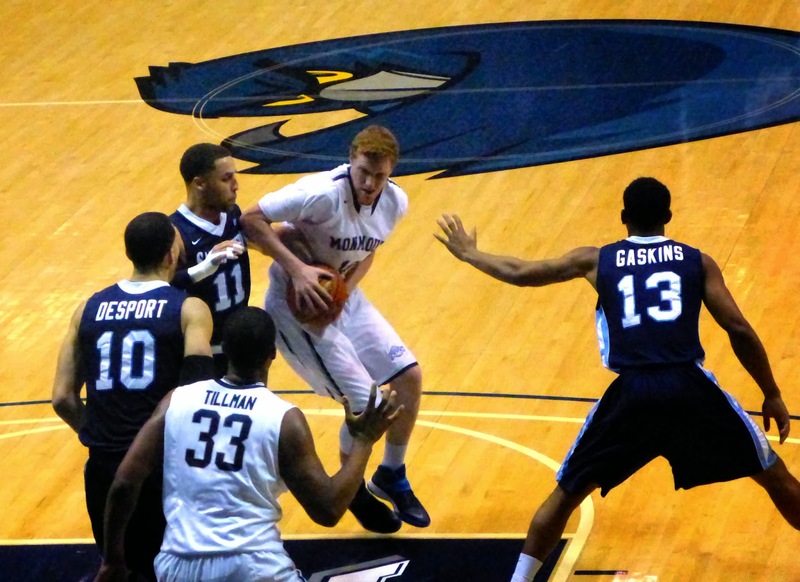 The game had just reached the first media timeout with Monmouth leading 6-2, so we hadn't missed much. I was immediately surprised at how full the arena was. Capacity here is 4,100 and there were 3,899 fans in attendance. 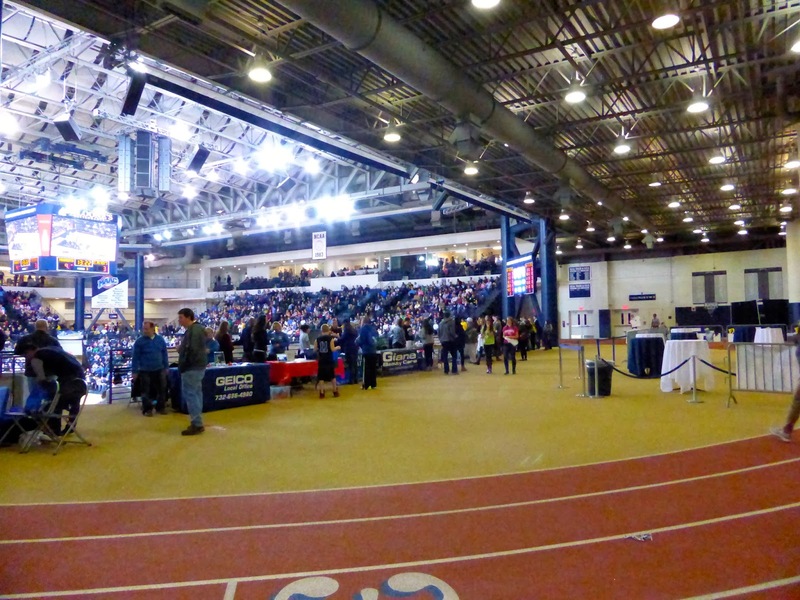 Compared to the games I had seen earlier in Brooklyn and Stony Brook, this was a madhouse. The court is beneath a running track as you can see below, with two levels of seating. The upper level consists of temporary sections that are moved aside when there is no game happening. The student section was filled up, with the football team an obvious presence. Turns out they were there for the halftime ceremony, in which former Hawk and current Dallas Cowboy Miles Austin had his jersey retired. You can stand behind the end zone here, which I enjoy as it gives you a better view of the play developing. Many students and families choose to do this as it gives you room to move around and leaves you closer to the concession stand as well. Although food options are limited, they are better than you get at other small Division I schools, with a chicken or meatball parm sandwich just $5 (add $2 for chips and a fountain drink). There was also a stand handing out free tacos and nachos. 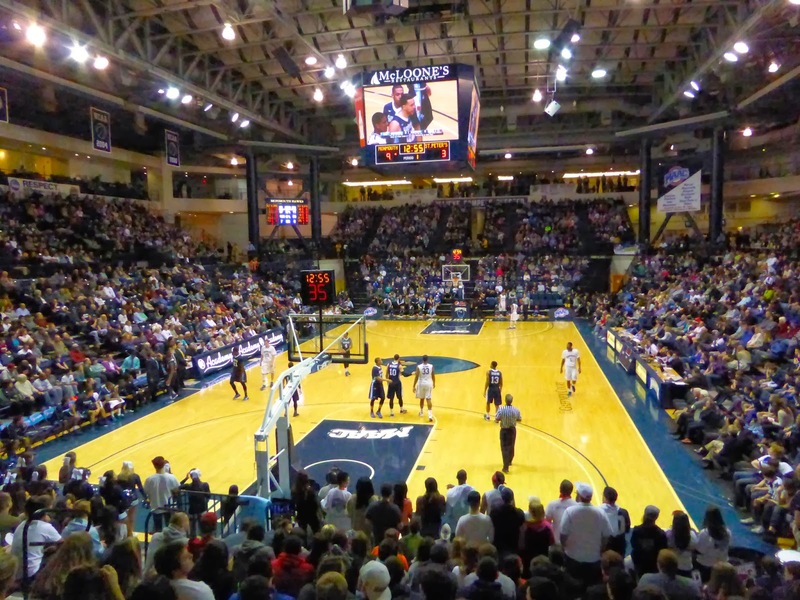 As I was doing the Stadium Journey review, I didn't really follow the game during the first half, but Monmouth's lead dissipated over time and they went to the break down 30-23. At this time, Eddie and I went to our seats, which had been appropriated during our absence by a large family. Rather than disturb them, we moved to some empty seats at the top of the section and watched the rest of the game from the vantage point below. The second half saw Saint Peter's (based in Jersey City) quickly build their lead to 12, and the Hawks were unable to get much closer the rest of the way. Whenever the deficit hit 6, the Peacocks always made the next basket or free throw. With 2 minutes to go, the score was 51-45 after Josh James (#0 below) made a couple of freebies for Monmouth, who then went into foul mode in a vain attempt to pull even. Those last two minutes seemed to take forever as Saint Peter's went to the line 14 times, draining 10 of them to win 61-51. I hate it when teams intentionally foul once the game is clearly over, as it was here. The constant whistles only serve to prolong the agony for the home fans; once you have lost, let us get on with our lives. Chris Burke led Saint Peter's with 16 points, while James was the game's high scorer with 18 and big guard Andrew Nicholas (below with the ball) contributed 10 despite hitting just 4/13 from the field on a gimpy knee. 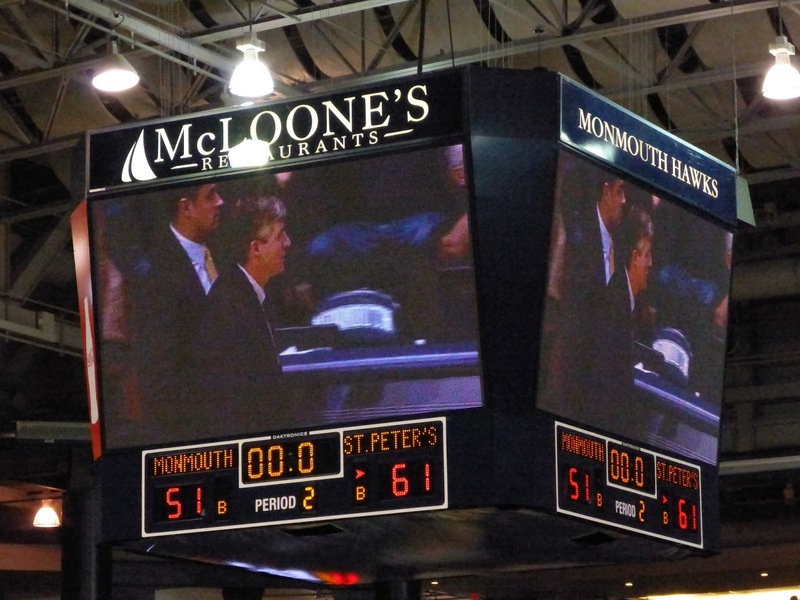 Both teams shot just 37% but Saint Peter's managed 7 from downtown to just 3 for Monmouth, and that was the difference. 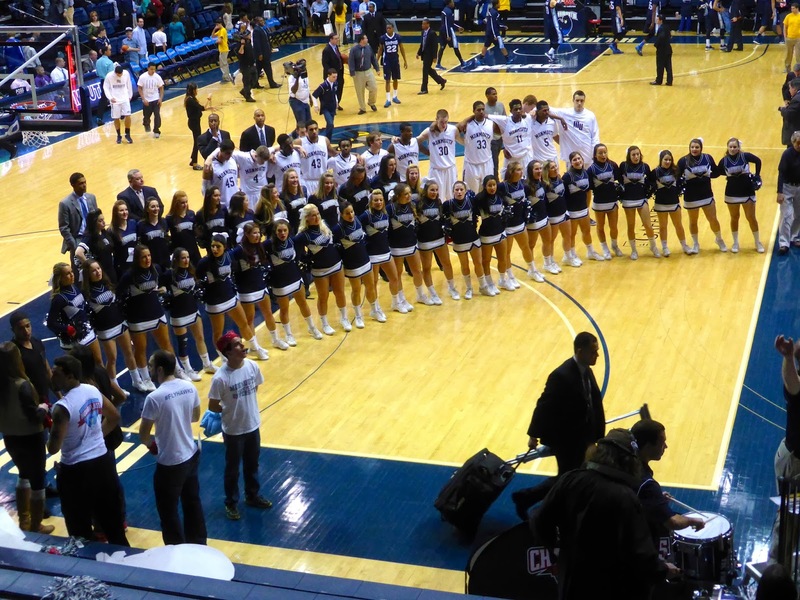 After the game, the band plays the alma mater while the players and cheerleaders sing. 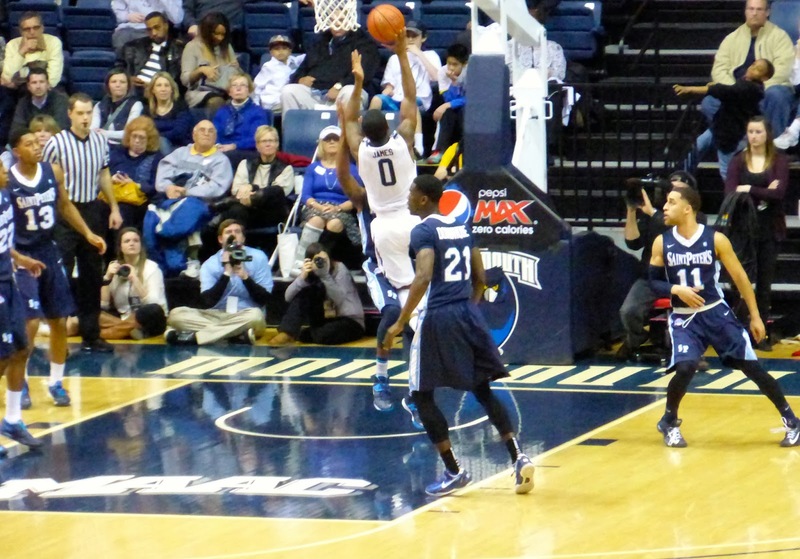 The players did not have much enthusiasm after suffering their 9th straight loss. The teams played a couple of weeks before at Saint Peter's with the Peacocks winning that one 61-50, showing some consistency at least. They may also meet in the MAAC tournament as they are currently sitting 8th and 9th in the 11-team conference and the first 5 teams get a bye. Safe to say that neither is heading to the NCAA tournament though.